A link to the cover page and preliminary EQ yardage requirements are posted below so you can start planning. I hope you’ll join me in making this quilt. Updated 7/24/10 — I found a discrepancy between EQs estimate and the actual cutting instructions. Please see revised cutting chart posted below which shows the change. To answer one of the questions I got via email – the binding yardage is not included in the yardage chart, only the fabrics for the top. Also, the plain border strips in the directions are pieced end to end with a straight seam and not on a 45 degree diagonal. Since the yardage is based on 40″ of useable fabric, it is the best use of the fabric to use straight seams. 7/2014 — This pattern is no longer available. I cant find the pdf`s. Can you help me?? This was a pattern several years ago which was only available for a limited time. I just love your work honey child. There’s always more in the works Elizabeth 🙂 Just have to find the time to write them up. Christmas Charm will be coming over the Thanksgiving holiday. There’s a link to it in the right sidebar. Thanks Caroline – glad you like it. No published books. There are more of my patterns in the Free Pattern link on the blog on the right side and at the Hoffman Design link there. Thank you Denise for the beautiful pattern. Sorry that I’ve only now downloaded it but I wish you a very belated Happy Birthday. Glad you got it Ruthie. Hope you’ll share a photo if you make it. What a lovely pattern thanks for being so generious to us all. you are a very talented lady. Belated Happy Birthday and thank you! I love the pattern. We share a birthdate! I hit the senior citizen age of 62 this year. Congrats to both of us. I love the simplicity of this quilt. Thank you for offering it. Happy belated Birthday Janeen! That’s why I like this design too – simple and uncluttered and large blocks so large fabric pieces. It’s so easy to put together. really lovely, thank you! I will add this to my already long list of need to makes! A very Happy Belated 50th Birthday. Welcome to the club of mid-age crisis but thank God with the kind of hobby that we have it helps a lot. I just got my EQ7 recently. I will try on your pattern soon and it is such a lovely one that you have done and i love the colours too. Happy patchworking and warmest regards. Thanks Nonie. Glad you like the design. EQ7 is such fun – I still have to explore some of the newest features. Thank you very much for your präsent to us und gratulation to your birthday. Happy Birthday first, what a beautiful quilt, you are amazing! Thank you for the beautiful pattern,Have the leaf templates now.Thank you,Happy Birthday. thank you for the beautiful pattern. HAPPY BIRTHDAY to you. Where are the leaf tempplates? Thankyou for the lovely birthday present – and HAPPY BIRTHDAY!! Hope your special day is wonderful. HAPPY BIG 50! Sounds like you had a great day! Thank you Denise! 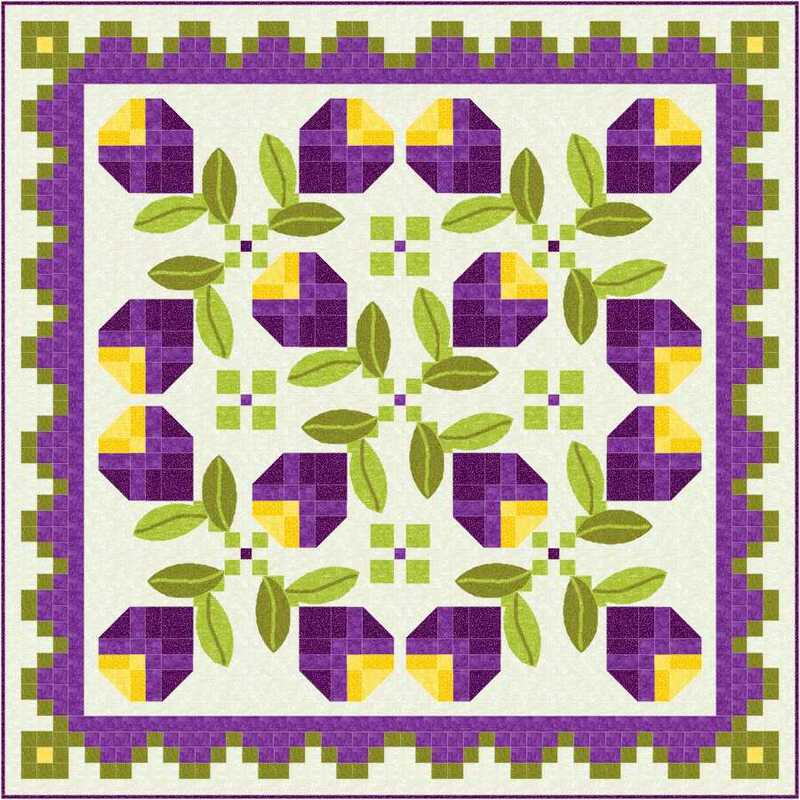 I’ll print off the Crocus instrucitons—really a gorgeous quilt! Happy Birthday!! and thanks so much for the gift of such a beautiful quilt pattern. Hope your evening is as good as your day sounded. Thank you Denise and HAPPY BIRTHDAY! I hope you have a wonderful day. to us. You’re so sweet. This is a beautiful quilt, I’m glad you are sharing with us. Happy 50th-I’ll be joining you on Aug 3! I followed you on the Crop Circles, missed the first one, But I worked it out. Lovely design – are there some “log cabins” in there? I am looking forward the next installments – and a very happy birthday to you! Donna – glad you found me. 🙂 Nope – not a log cabin to be found in those blocks. was wondering if the Fabric 6 which I am assuming is also the border fabric is the lighter or darker purple. It is hard for me to tell from the pictures. Fabric 6 is also in the border and it is the lighter of the two flower colors. I just recolored the quilt with some different color combinations for more ideas so check today’s post to see what it could look like in a few other colors. just found you and wow! Well my Friend Alberta and I will be making this quilt..I had told self I was not starting on another project until I was caught up on UFO`sbut of course Alberta had to tell me about it and when I saw it with the beautiful colors,oh well another time for the UFO`s. Glad you and Alberta will be joining in! If I was ever caught upon ufos I wouldn’t know what to do. 🙂 I’ve been sewing ahead on mine as I write the directions and it goes together quite quick and easily. I am definitely planning on making this one for my daughter as she loves purple/lavender. I have checked my fabrics and only need to get the background fabric, so I am ready for the pattern. Glad you’ll be joining in. Thanks for this lovely pattern. It’s very kind of you to constantly share your talents with us all. Love your crop circle quilt. Your “Crocus Clusters” is beautiful. Thank you for the wonderful birthday present. Wow! 100 inches square! My oldest son and his sister will have a wrestling match to see who gets it! hehe I have the date on the calendar. Thanks, Denise!